I wrote a small tool to import K2 content from a CSV file and to export K2 data to a CSV file. Its possible to import all fields including "extra fields", userids, images, tags, galleries, categories and attachments. For "Multiple Select" Fields use also "," to separate the options e.g. : "option 1, option 3"
To have a example-file to first an export and check the documentation . To stay up do date and informed follow me on twitter and have a look at this topic. I followed your instruction page,how ever, what are the steps?? to make csv from what? from my joomla articles? You basically can create some items in K2 and the go to Components -> K2 Import / Export and export your existing items then you would have example file. Or you check the example file in the documentation. I read the instruction page. I uploaded the sample CSV that you gave but than I got like 5 sample categories and 5 sample items,all users was imported and 2 user groups: registered and site owner,thats it. now what I have to do in order to get the site categories and items??? sorry I do not understand your problem. 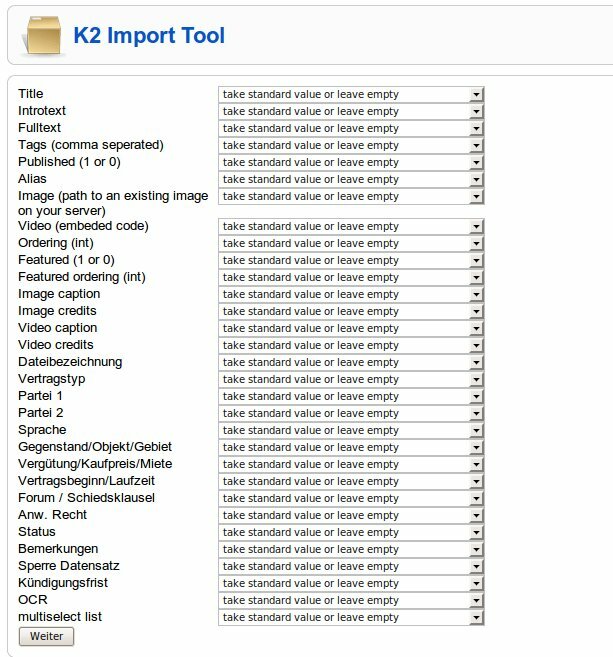 When you upload and import the CSV you should have new items in K2. any plans to update to 2.5? William White wrote: any plans to update to 2.5? Are they somewhere informations about how the DB changed between 2.4 and 2.5? and are there differences between the versions of Joomla 1.5 and Joomla 1.7?